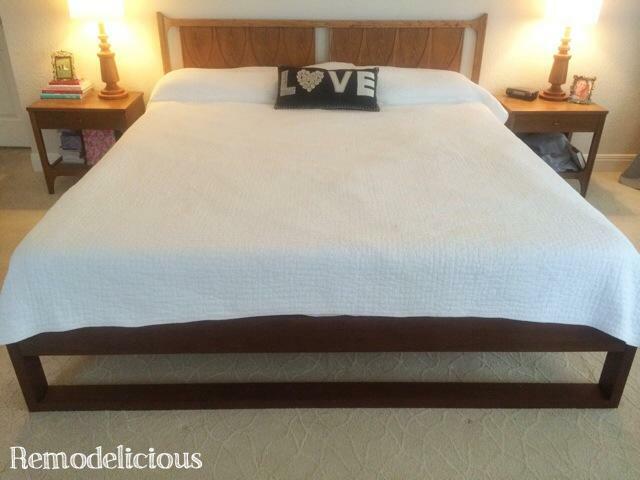 For the longest time, we’ve been meaning to get around to a fairly important item in our home… our own bed. 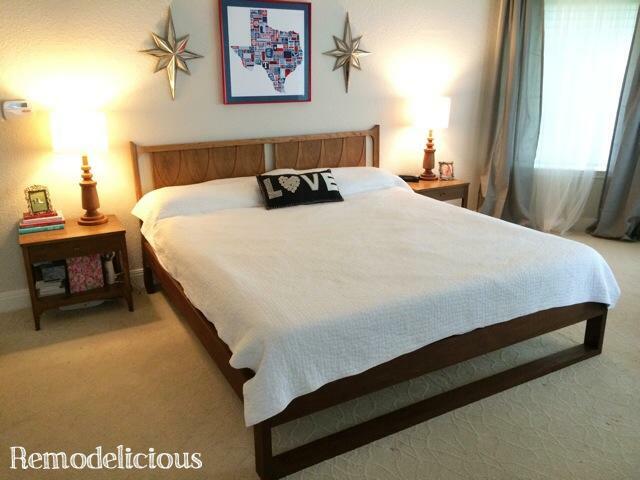 Can you believe that our old home was on Apartment Therapy with box springs on the floor for a bed? Yeah, not my proudest moment. 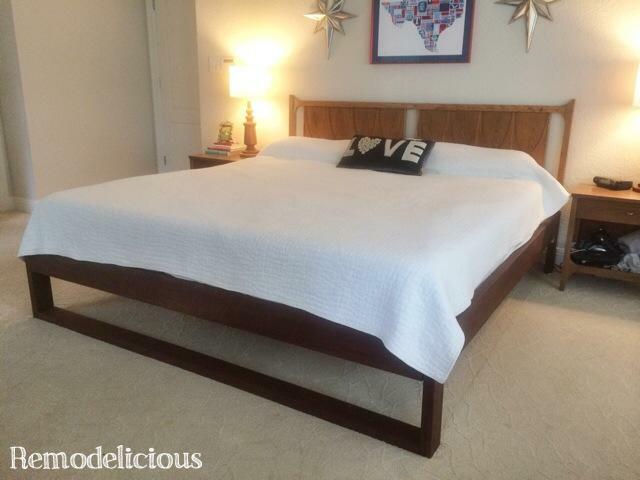 Long story short, our old canopy bed that looked great on our previous craftsman-style home was obnoxious in the small, mid-century modern master bedroom so we sold it with plans of replacing it shortly afterward. It’s been one of those things I apologize for when giving friends a tour of our home. Here’s our beautiful new home, don’t mind the college-style bed we sleep on as adult parents. So fast-forward to a year and a half after moving into our 3rd home together. Definitely time to get this bed thing sorted out. Basically everything we found that we loved came with a price that we didn’t love. It’s why it took us so long to deal with this problem in the first place, so we had to do something about it. That’s when the DIY bug hit. We don’t have a garage full of tools or experience with furniture building or carpentry, but we really wanted a legitimate bed. I looked at plans forever before finally finding this simple plan inspired by a modern West Elm bed. Decor and the Dog has great photos and even did a plan in sketch-up PLUS they included a cut list for all sizes. Thank you so much for putting this together, guys! We considered other plans, but this was the simplest and the only plan we didn’t really need to modify to make a king-sized platform bed. I LOVE how our bed turned out! I still need to darken the headboard to match, but couldn’t wait to share. I’m sooooo glad that our bedroom is finally getting some attention after just moving what we had in a year and half ago. Naturally, I found a way to complicate the project. Decor and the Dog used stock pine lumber from the hardware store. I wanted to use something a little more high-end to go with our antique walnut furniture. We had some Ipe 2x6s left over from another project that I decided to use because it’s beautiful and strong. If you don’t know much about Ipe, it’s the diamond of the wood world. It’s super strong, super heavy, and super hard to work with. E-v-e-r-y-thing has to be pre-drilled. E-v-e-r-y-thing takes a million years to sand. But, I knew it would be a beautiful result if I exercised some patience + it was free + it helped to clear out our scrap pile. Since these boards had been sitting outside, they were weathered. I first cut them to length (and cut a couple 2×6 boards down to 2×4 since I was using scrap), then planed them and sanded them with an orbital sander. Sanding the endues of any wood will help to give it that polished “I know what I’m doing” look, even if this is your first major project like this. Fine grit sand paper, 150 grits and higher (I usually use 220-400 for finish sanding). 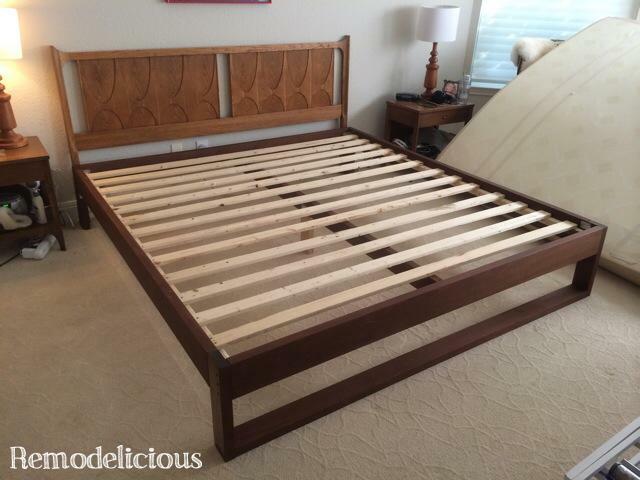 We assembled the footboard and headboard + and pre-drilled the sides outdoors, then brought the bed in for assembly after applying Danish Oil. I had planned on doing pocket holes with my Mini Kreg Jig, but discovered that it wasn’t possible to create pocket holes in Ipe with the Mini Jig. It may be possible with more heavy duty equipment, but this jig was not up for the task. Instead, we used an assortment of metal brackets. We took care to make sure that the bed could be disassembled when we move (or when we get new floors, hopefully soon!) so the center support (brown piece of Ipe in the middle) is attached using a framing hanger so it will pop right out, and the sides will come off of the headboard & footboard with only a few screws. The major task will be removing each pine support board since they are all screwed in individually, but it should still come apart in less than 10 minutes. I really love how the bed turned out and I love not sleeping on a mattress & box springs on the floor. Seriously, it’s big-time moving up in the world when you’ve spend any amount of time without a real bed. What kind of weirdo’s have a high-dollar Tempurpedic mattress and no bed? I’m proud to be out of that club, especially since WE BUILT A FREAKING BED BY OURSELVES! It’s nice to be able to take some serious pride in your home. My husband rarely helps with these projects, so you know it’s high up on the wish-list when he lends a hand. I’ll have better photography soon once I get some technical difficulties sorted out and some other master bedroom projects we are working on out of the way. We’ve spent so much time in Chloe & Cora’s rooms, that it’s super nice to be spending some real attention in our own room. This is some serious fancy happening around here!